I first tried “matzah mac & cheese” at my friend Daniel’s Shabbat potluck dinner. For a few years running, he hosted huge groups of people every single Friday night, and his family provided most of the food. The menu hardly changed and this was one of the staple dishes. It may technically be a Passover food, but that didn’t stop him from serving it year-round to a room of happy eaters. Like a lot of Passover foods, you may question the name. This has no macaroni, nor does it use kosher for Passover pasta. It unquestionably tastes like matzah. 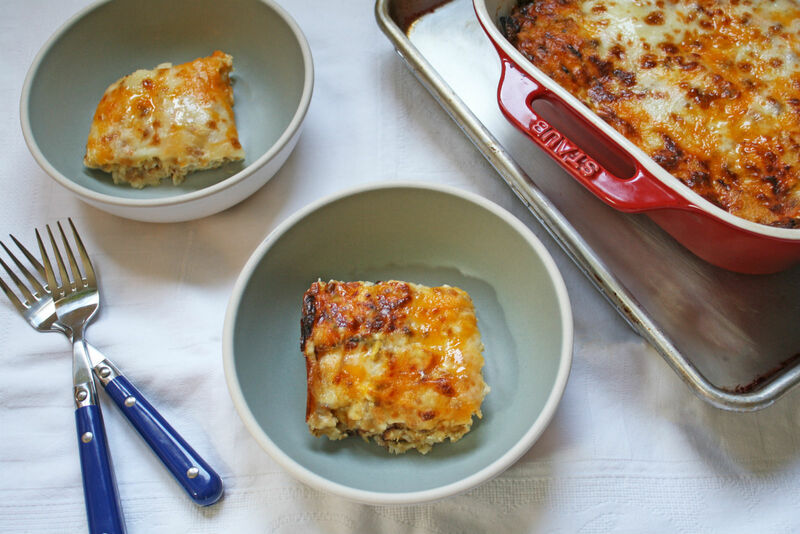 Matzah mac & cheese falls into the category of “matzah pizza” or “matzah lasagna,” i.e. things that get named after comfort foods you can’t have if you’re keeping kosher for Passover, and might taste a little different from the original. I have no problem using matzah as a substitute for crust or in place of sheets of pasta, especially if it tastes good. There’s a humility about it that feels true to the spirit of the holiday. Whatever you choose to call it, this dish is cheesy, creamy, and filling. And as a comfort food, it should not be confused with health food. This is the get-me-through-the-last-days-of-this-holiday-all-I-want-is-pizza food. This is the kind of dish you throw together last minute when you want to spend less time in the kitchen; served with a big salad and you have a complete meal. Try making it after the seders — and after the leftover matzah ball soup and brisket are gone. This is the dish you taste and think about eating next Passover. Grease a 9” x 13” baking dish, ideally ceramic or pyrex. In a large shallow dish, whisk together the milk, eggs, salt, and pepper. Use a dish that is large enough to place whole squares of matzah into. 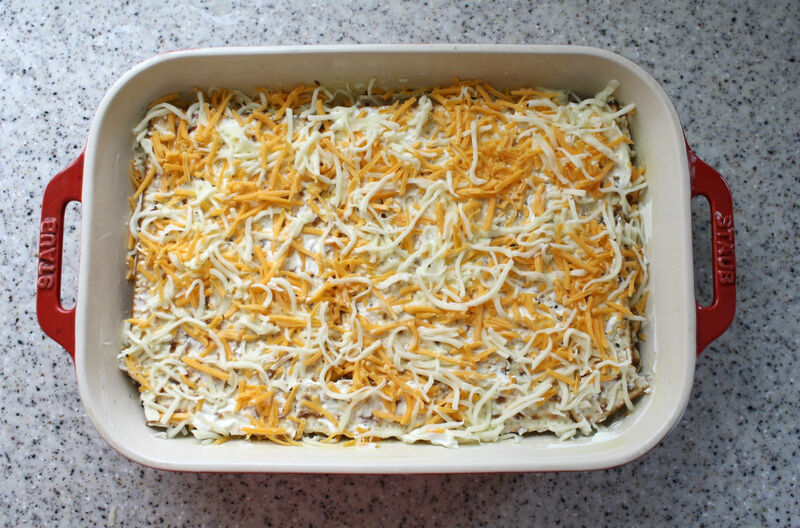 Dip squares of matzah into the egg and milk mixture before placing them in an even layer on the bottom of the baking dish. Use about ¼ cup of sour cream and spread it evenly onto the bottom layer of matzah. Top the matzah with a heaping ⅓ cup of shredded cheddar cheese, and a heaping ⅓ cup of shredded mozzarella cheese. Repeat the process two more times with layers of dipped matzah squares, sour cream, and cheeses. Add one last layer of matzah for a total of 4 layers. Top the matzah with the remaining sour cream and a generous ½ cup of each kind of cheese. Pour the remaining egg and milk mixture over the layers of matzah and cheese. Cover with foil and bake for 35 minutes. 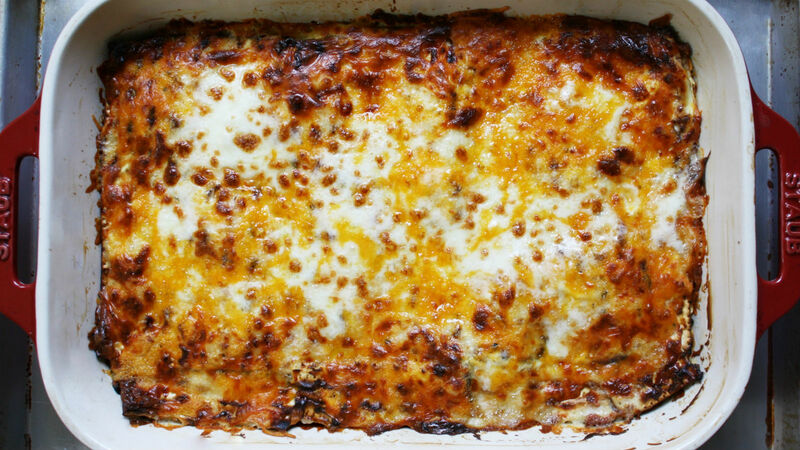 Uncover the dish and bake for 5 minutes uncovered, until bubbly and cheesy. Almost all of the liquid should be absorbed into the matzah at this point. If you like your matzah mac & cheese browned on top, turn the oven to broil, and broil for 1-2 minutes (watch carefully, the top will brown fast). Let the dish rest for 5-10 minutes and then serve.